Tortellini are a crowd pleaser. Counter the carbs with nutritious veggies: mushrooms, red bell peppers and zucchini. Photo courtesy of MushroomInfo.com (the recipe is on the website). If you enjoy this Pasta Glossary, we have a food glossary for almost every category of food. Check out your favorites! the appropriate page of this glossary. 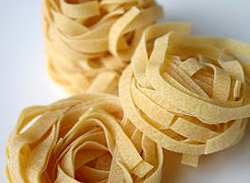 Tagliatelle (tal-ya-TELL-lay) are the classic thin egg noodle of Italy. This cut originated in Emilia-Romagna, the region that also gave us balsamic vinegar, Parmigiano-Reggiano cheese and prosciutto di Parma (not bad for starters). The flat ribbons of pasta are slightly thicker than fettuccine. It is typically served with a rich meat ragù. The pasta is wide enough to hold such a heavy sauce; yet, it is is also delicate enough to serve with a creamy sauce. A classic preparation includes mascarpone cheese, smoked salmon, Parmesan cheese and chopped dill. A narrower version of tagliatelle (see above), tagliarini (tal-yeh-REE-nee) is a flat, wide egg pasta. It is similar in size to fettuccine. It is traditionally served with butter sauces. These are mung bean threads, translucent, gelatin-like noodles cooked in the same manner as rice noodles. While the Asian word translates as “threads,” note that the translation of “spaghetti” is similar: cords or strings. Torchietti (tor-KYEH-tee) are literally, “little torches.” These short, bell-shaped noodles go well with plain tomato sauces. (Photo at right.) They originated in the Campania region of Italy. A twisted pasta shape, excellent for catching sauce (tohr-coe-LEH-tee). Torchietti, “little torches.” Photo courtesy of SXC. 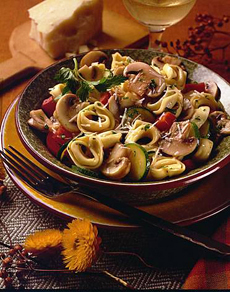 Tortellini (tor-teh-LEE-nee) is a small pasta stuffed with a variety of fillings, and a favorite pasta dish worldwide. It is also served in soups, as in the classic dish, tortellini in brodo. Tortellini originated in Bologna and is accompanied by a legend: When the goddess Venus stayed in a tavern on the outskirts of the city, the innkeeper spied on her through the keyhole of her room, but could catch only a glimpse of her navel. Spellbound, he went to the kitchen and, to capture this vision, shaped fresh egg pasta into the navel-sized tortellini. Tortelloni (tore-teh-LOE-nee) are larger than the bite-sized tortellini. Tortiglione (TORE-tee-LYOE-nee) are twisted, spiral tubes that are used in oven-baked dishes and with thick tomato or vegetable sauces. 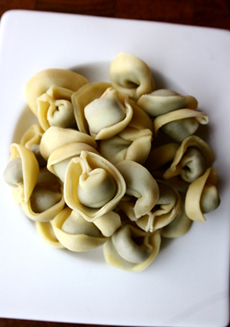 Photo of Putney Pasta’s tortellini. Click on the link to read our review. Photo by B.A. Van Sise | THE NIBBLE. Trenne (TREN-nay), triangular penne, are a modern invention: (the tubes are not round but three-sided triangles). The name is a contraction: penne + triangolo (triangle) = trenne. Like penne, the size and density of the triangular tubes with the bias-cut ends are versatile for most preparations: cheese sauces, tomato sauces, straight from the pot or baked further in the oven (“al forno”). The triangular shape makes them that much more fun. A long, flat ribbon pasta, trennete (treh-NEH-tay) are very similar to linguine. The classic Ligurian dish is pesto and trenette; although or oil, garlic and chili pepper are also a classic dressing. Trenne are available from MurraysCheese.com. Thinner trofie (troe-fee-EH-teh—photo at right). 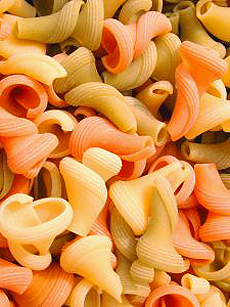 A creative shape, where the pasta is curled in rings around a center stalk. Ideal for salads or soups (troe-TOE-lay—photo at right). 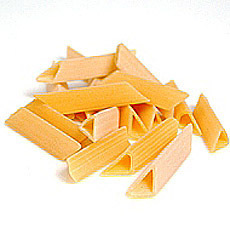 Italian for “little tubes with lines,” this small-to-medium size pasta cut (the tubes are about 1/2" long) is often used in soups, typically in minestrone. This cut can be substituted for ditali, pennette or elbow macaroni. Pronounced too-BEH-tee. Tiny tubes, similar to ditalini, used in broth. Pronounced too-beh-TEE-nee. 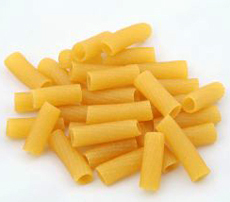 Pastas in the shape of a tube are available in many different sizes and shapes. Some tubes are long and narrow while others are short and wide. They can have smooth or grooved (rigate) exteriors; their ends can be cut straight or at an angle. They work especially well with heavier sauces, which catch in the hollows of the tubes. Some of the larger tubes like manicotti can be stuffed with meat and/or cheese and then baked (al forno). Among the smallest tubular pasta is elbow macaroni, often used for the popular dish, baked macaroni and cheese. Rigatoni. Photo by P. Burnett | SXC. 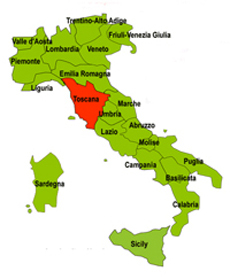 A region in central Italy, bordering on Lazio to the south, Umbria and Marche to the east, Emilia-Romagna and Liguria to the north, and the Tyrrhenian Sea to the west. Tuscany is known for its wines, including Chianti and Brunello di Montalcino. The capital is Florence and provinces include Arezzo, Grosseto, Livorno, Lucca, Massa-Carrara, Pisa, Pistoia and Prato. The Tuscany region of Italy.